When it comes to nursing care, there are few things as versatile as nursing scissors. Come to think of it, have you ever noticed a nurse in any situation that doesn’t have a handy pair of nursing scissors nearby? That is because when it comes to patient care, few things take care of just about any situation you can name as a handy pair of Color4care scissors. But the ones that nurses will use are special; they are strong and can be used in circumstances where having a sharp edge is critical. Just about any nurse worthy of the title will have a pair of these in their pocket at all times. If you have ever wondered why, the reason is simple. In just about any medical environment people need to have something cut off or removed. The most obvious one is the patient ID band that everyone gets when they enter the hospital. Why even the Mayo Clinic makes you wear them. I am betting that the last time you had one; a nurse came along with a pair of scissors and cut the extra length off so it wouldn’t continue to annoy you. That is a good enough reason on its own for any nurse to want to keep a pair of scissors handy. Are Dull Scissors The End? As you would expect, anything that gets as much use as a pair of nursing scissors are bound to become dull. When this happens, you would expect that the only thing you can do is go out and buy another pair of scissors. But you have another option; you can sharpen your old pair.Yes, it is true that sharpening them takes time, but it could be quite worth it. These days the best solution would be to invest in a sharpening tool and then make it worth its price of investment. If you don’t want to spend the money I can share a little trick for sharpening scissors effortlessly. Just take aluminum foil and fold it several times until it is quite thick. Then take your scissors and cut the foil up into thin strips. Your scissors will be sharper in no time! So don’t despair if your nursing scissors have gotten a bit dull from constant use. Just borrow our little trick and keep those scissors in tip top shape. Many nurses would agree that a good, trusty pair of nurses scissors are one the best investments they ever made and one they always have in the their tunic pocket when heading off to work. Not all medical scissors are the same though and it helps to have an understanding of what types are available and what jobs they were designed to do, then you can be sure to choose the correct pair for you in your role on the ward, in clinic or in a GP practice. Before considering anything else though you must ensure that you are looking at medical quality products manufactured specifically for use in a medical setting and manufactured to the relevant (or equivalent) European standards under sanitised and controlled conditions. For products specifically manufactured for sale in European markets the scissors or forceps will be marked on the body of the instrument with the letters “CE”. The CE actually stands for Conformité Européenne (European Conformity) and identifies a product in a controlled product category that must be manufactured to stringent manufacturing standards. Other products such as those from American manufacturers such as Prestige Medical might not have the CE mark as it is not of course required in the United States but those products are manufactured to the required standards for sale in the EU. You can see just how rigorous the conformity process for medical devices is by visiting the UK government web site that helps companies attain the CE conformity. 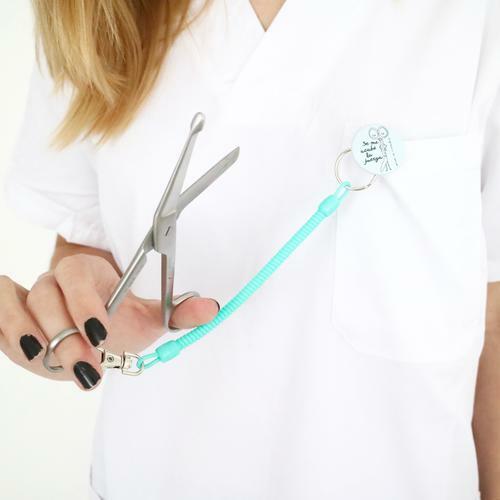 So buying the cheapest product you can find is not always the best option to take, instead ensure you are purchasing a high quality pair of nurses scissors designed to be used in a medical environment. That means the instruments will be safe to use with patients and should be capable of being put through an autoclave for reasons of hygiene. There are 3 main types of general use medical scissors that a nurse might use in her/his day to day role and these are standard dressing scissors, Lister bandage scissors and tough cut scissors which are also called EMT shears of A&E shears. The first type to consider is dressing scissors and theses are available with a variety of blade types and in a range of sizes. The standard size used by most medical professionals are circa 14cm in length and are manufactured from high quality stainless steel, the size in generally considered the perfect fit for tunic pockets so keeping them to hand and available at all times. There are 3 types of blade variant available the first normally being called blunt/blunt bladed where both blades terminate in a blunted end. The effect of this is 2 fold in so much as the blunted end helps to guard against stick/stab injury to the patient when removing dressings etc., the second benefit is that when stored closed in the pocket of the practitioner the blunted ends will not cause injury when bending and stretching to help care for patients etc. Blunt/Blunt dressing scissors are also available with coloured rings in pink, blue or purple and these too are compatible for use in an autoclave. The second blade option is blunt/sharp and as the name suggest this configuration provides the user with one sharp ended blade which can useful for specific small and precise jobs around the ward. The third option is sharp/sharp blades where both blades taper to a very definite point, this version is often referred to as stitch or suture scissors for obvious reasons, best to remember these are in your pocket when bending though as to forget can prove painful. As an aside a number of nurse pocket and belt equipment organisers are available and not only do they help to keep required instruments safe and secure such as pen torches or medical forceps etc. but they also keep sharp bladed scissors safe. The most popular of these types of dressing scissors by some distance in the blunt/blunt ended version but as always the choice is a personal one and most nurses soon come to realise which type will best suit them. Many healthcare professional also own a pair of Lister bandage scissors which have angled blades at set at about 45o and also have a blunted lower tip. These two design innovations allow the scissors lower blunt ended blade to be inserted below a dressing and for the dressing to be then cut away from the patient via operation of the upper blade only. So a cutting action is generated without pressure on the patient and at the same time as another safety benefit the blunted blade cannot cause injury. Very little information is available about the origins of the name though it does seem to have some relationship to the great English surgeon Joseph Lister who was a pioneer of antiseptic surgery techniques. In effect Lister carried out operations in a operating room infused with airborne diluted carbolic acid and any wound were dressed in similarly treated gauzes and dressings. At around this time any number of surgical products were given the title “Lister” such as specific knives, forceps and even dressings. The implication seems to be that these instruments were intended to enable more antiseptic procedures to be carried out with less risk of infection occurring hence desire to tie the instrument to Lister himself. This same idea of using an angled blade is evident in the third type of medical scissors a nurse might use and as stated earlier these are variously called tough cuts, A&E shears or paramedics scissors, and again this design has the same blunted lower blade allowing dressings and indeed clothing etc. to be quickly and efficiently cut away so that wounds can be accessed and treated with speed. When choosing a pair of tough cut scissors the user can choose between two size options (pocket sized 15.5cm and larger 19cm) and a myriad of colour options, it helps to know yours were the purple ones in case they walk! The most important point though to remember when thinking of purchasing a pair of these scissors comes back to quality, make sure they are either CE marked for EU conformity or come from a reputable American manufacturer. You want the tough cuts to perform well when needed in an emergency and so manufacturing quality is very important. A properly manufactured pair of tough cuts will have serrated edges on the blade that have been machined into the blade making for a tough and sharp cutting edge when needed, some of the cheaper imports only have blades that have stamped blades giving an inferior cutting performance, you really do get what you pay for. Other variants of A&E shears can also be found that offer the user either distinctive design with one type called Stylemates or added function where the blade of the scissors coated with a non-stick coating.